This post isn't so much about working on something new, well - it's more about a work in progress to turn my living space into a single-person functional studio space...the metro shelving rack of equipment is in my bedroom, so we will just leave it at that. 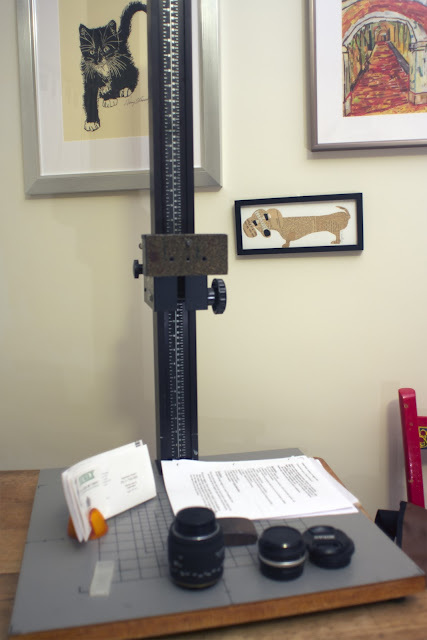 I have my very own animation stand, dude - it's lovely and completely functional...very happy. Kittens and dachshunds, impressionist asylum hallways, and out of focus lenses...oh my. It makes it a lot more fun especially knowing I have a new small project to work on with my friend Dione. That and the US Government finally OK'd my official copyright for Black Box...only took 11 months!